Online directories used to be a whole lot more popular in the past. They may have lost some of their luster, but niche online directories could still generate revenue for your business. You are going to need a decent theme to make your site more attractive to your visitors. 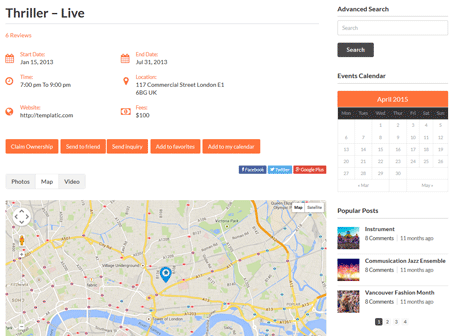 Eventum for WordPress happens to be a premium theme for event portals with support for recurring events and Facebook events. Eventum transforms the Directory theme into an advanced events portal. You will be able to customize the homepage easily. Eventum is mobile friendly and lets you create recurring events. Your visitors will be able to RSVP to events and review the information from the front-end dashboard. It is also possible to connect your site to Facebook to display Facebook events. The Eventum theme not only lets you display events but also charge for submissions. It is optimized for global sites. The theme lets you create new post types, customize the homepage with widgets, and offer advanced location filtering. There are also various premium add-ons available for the theme. Eventum is a premium theme.